The Boy asked for these and I always try to make things that make him happy. So I made these for Easter. It is a peanut butter cookie that I had never tried, but instead of peanut butter chips, I used semi-sweet chocolate chips because that is what the Boy requested. It is an odd thing. I love peanut butter – peanut butter and apple jelly sandwiches, peanut butter toast, peanut butter in my oatmeal – with raisins if possible – but I am not a huge peanut butter cookie fan. I think it is because so many of them have a dry, sandy texture. I also do not like peanut butter mixed with chocolate. As I have said over and over, I am not a chocolate person and there are only a couple of things I like mixed with my chocolate – caramel, toffee, or nuts – or some combination of the three. No peanut butter, no coconut, certainly not orange, oh dear lord, please no mint, blech. I know, I am seriously fussy – about just about everything. Anyway, back to peanut butter – this is a recipe I’ve had for years and have never tried so this gave me the perfect opportunity to do so. This is … wait for it … a Gwyneth Paltrow recipe that I have modified, but I will qualify that by saying it is a recipe from her maternal grandmother that her grandfather loved. Family recipes are the vast majority of the time a very good thing. So I tried this – it’s easy to put together with things that I had on hand which to me is a huge bonus. If you compare it to the original, I did make a few changes (I only use light brown sugar for instance) and swapped out the peanut butter chips for semi-sweet chocolate chips, per the Boy’s request. I have learned over the years that if you taste the raw dough you will get a good sense of what the cookie will taste like and I thought this worked out well. I also made a test cookie with no chocolate chips just to try it as a straight up peanut butter cookie. It worked well. That said, it is a soft cookie, so it is best to let it cool completely before moving it about too much. Hood approved of, and ate half of, the plain peanut butter cookie – think there might be some dog treats with this in the future. Preheat over to 350 degrees. Line a baking sheet with parchment paper. Sift together dry ingredients over a piece of waxed paper. In the bowl of a stand mixer, cream together butter, peanut butter, and brown sugar. Mix in egg and vanilla. Add flour mixture a little at a time. Stir in chocolate chips. * I always use unbleached, just a habit. ** I am a Jif PB person. 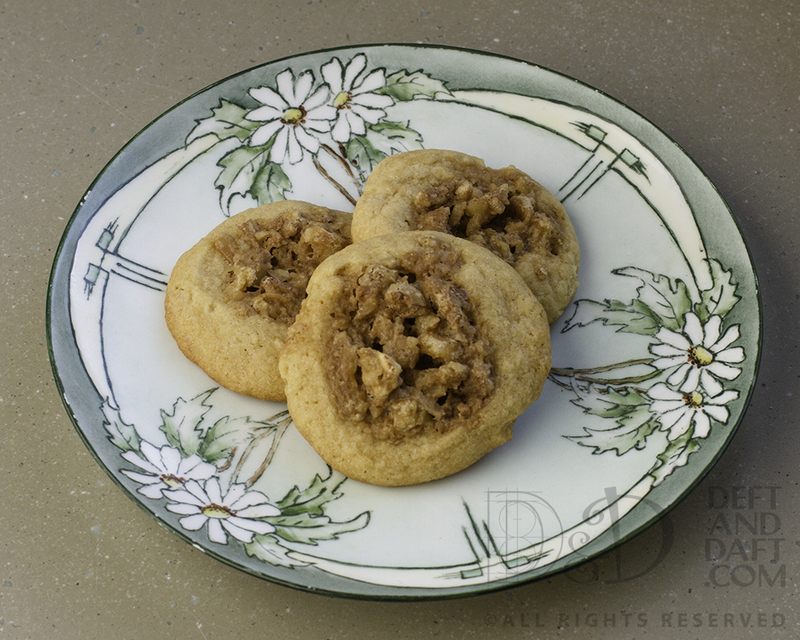 9 April – 1 Egg – Salted Crispy Butterscotch Pecan Cookies (These are just amazingness it self – so far these are favorite of all the people I take cookies to). 16 April – 4 Eggs – Buttermilk Bundt Cake with Lemon Glaze – don’t do this. 21 April – 2 Eggs – Lemon Ricotta Cookies – do not do this either. But do this – Yes This. Today the Boy locked himself out of his vehicle and the MotH went and provided him with the spare key. It is now on him – he now has the spare. But I sent M&M cookies because I had made them this weekend and I know they are one of his favorites. That said, I still bake like he is here most of the time which, with his life, is not the case. So I share my baking with my friends at the office, which I’ve always done and I appreciate the fact that they don’t mind to be (unwilling) guinea pigs. But I also ask friends at a restaurant that we frequent for what they would like. It makes me try different things, which makes me happy. This was new to me – peanut butter and chocolate mixed together. I would have never done this on my own. That said, I love peanut butter and like chocolate well enough, but mixing them is just – ewww for me. So I had the MotH try these bars and he was a fan. But this past weekend we could not get to the beach to deliver them. So now I have the bars in the freezer so I can make someone kind-of-happy if we get out there any time soon. I hope so, but right now the forecast does not look good – it is supposed to be sunny this weekend. Strange as it sounds, I’d like some rainy weather so I could get to my local at the beach. I am sure you have figured out where my local is – Shaggy’s Pensacola Beach. Preheat oven to 365 degrees. Spray a 9×13-inch baking dish with nonstick cooking spray, line with a parchment paper and spray again. Sift together flour, baking soda, and salt over a piece of waxed paper. Set aside for a mo (a moment – get used to it). In the bowl of a stand mixer, cream together butter and sugar, add egg, vanilla, and peanut butter. Add flour mixture into peanut butter mixture. Until just combined. Stir in mini chocolate chips. The dough is a bit stiff and you have to press into the pan (use wet hands) to get it evenly spread. Bake for 20 – 25 minutes or until edges are lightly brown and the center does the toothpick thing correctly but it is difficult with all those chips involved. Just give it a go or two. Notes: As said, I made these for a friend who particularly asked for this combination, but so far from the comments from my office they have been very well received. 2 September 2015 – 2 Tbs – Cheddar Orzo, but with Cheddar instead of Gruyere. All in cookie form apparently. Guess I’m keeping my friends happy. However, I need to expand my butter usage to include something that might resemble dinner. Or not.